Heater Holder - Silver Plated Discounts Apply ! 3" in length with a 4" safety chain and a jewelry-style clasp. 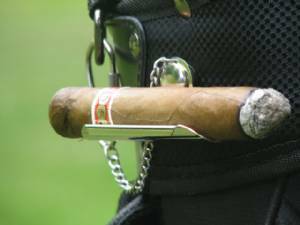 This silver plated cigar holder has an attractive beaded front edge, and holds up to a 54 ring cigar in style! Polished to a beautiful shine, this cigar holder is very sharp.